We went dessert crazy at Thanksgiving. The Holiday office party served extra sweets and more weight was gained. There was plenty of champagne on New Year’s Eve, and we woke up to the realization that the dried black-eye peas weren’t soaking. A crazy dash for the grocery store was made for collard greens, and the produce shelves were bare. If Southern tradition of eating black-eye peas and collard greens are strictly followed to bring good luck, a dismal year could happen. Not yet. Ignore our Grandmas’ disapproval, and buy a can of black-eye peas and purchase dark baby greens to make a salad. Rescue leftover hummus for a vinaigrette, and use sweet peppers from the antipasti plate at the New Year’s Eve party to add to the Black-eye pea and Kale salad. It’s a healthy salad bring redemption when we ate quite well during the holidays. Have a Happy and Healthy New Year’s Day. Toss feta cheese and salad greens in a large bowl. In a medium bowl, toss black-eyed peas, zest and juice of lemon, jalapeño, celery, parsley, sweet and hot peppers, red onion, garlic, oregano, salt, black pepper, crushed red pepper, smoked paprika, and olive oil. Whisk all ingredients for chickpea vinaigrette, except olive oil, in a medium bowl. Adjust spices. Whisk in the olive oil. 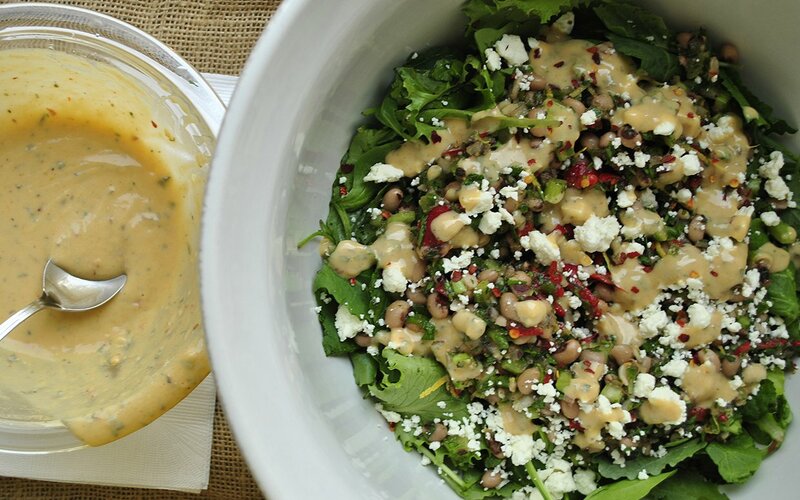 Drizzle chickpea vinaigrette over the salad. Enjoy. *If celery leaves are still attached and fresh, add them to the parsley. 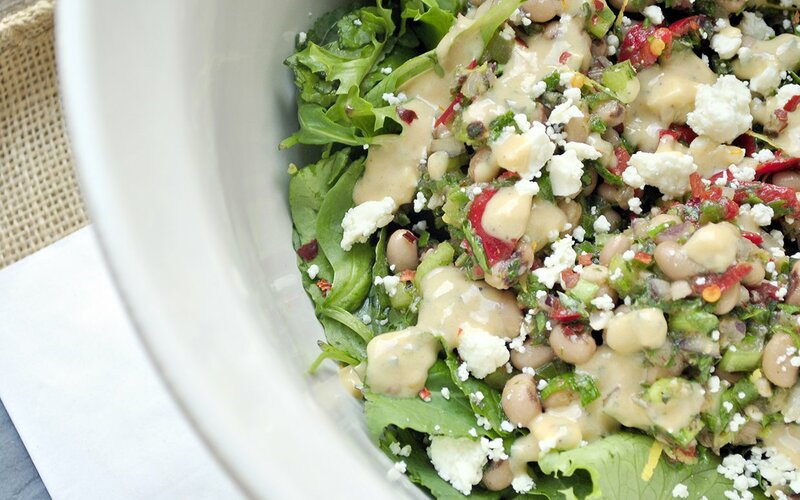 **If packing salad for lunch, pack the greens with feta cheese, black-eye pea salad and chickpea vinaigrette in separate containers. Combine all in one tightly lidded dish. Vigorously shake and enjoy. 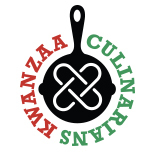 This entry was posted on January 1, 2015 by Sanura of MyLifeRunsOnFood.com in Recipe and tagged Black Eyed Peas, Chickpeas, collards, kale, MyLifeRunsOnFood.com, New Year's Day, Sanura Weathers.